Master Electrician Reference (or MER for short) is your electronic pocket electrician reference guide. 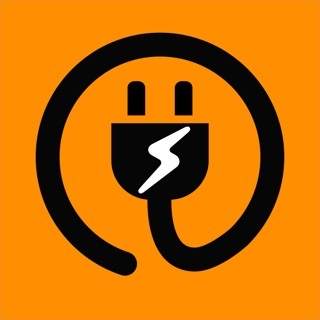 MER is for electrical designers, engineers, installers, contractors, facility managers, inspectors, exam candidates, apprentices, electricians, journeymen, architects, and technicians. MER is for people doing residential, industrial, and commercial work. Simply, if you are a Master Sparky or work with electricity in any way, this reference guide is for you! Have you ever lost pages or had damaged pages in your pocket electricians reference? The solution is here: Use MER to keep the most important information easily accessible on your iPhone, iPod Touch, or iPad. MER will even do calculations for you; something your old pocket reference book can't do. - Ohm's law, series and parallel circuits, capacitance, inductance, impedance, and reactance. 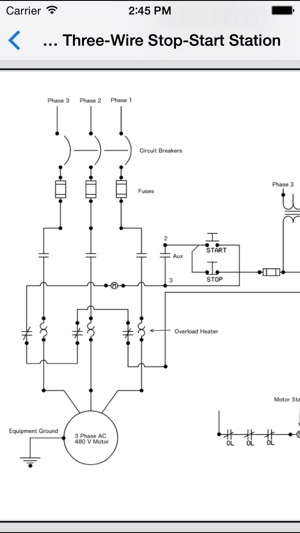 - Distribution wiring diagrams for 120, 208, 277, and 480 volts, color codes, breaker sizes, light switches and bells diagrams. - Formulas for kVA, kW, and HP. 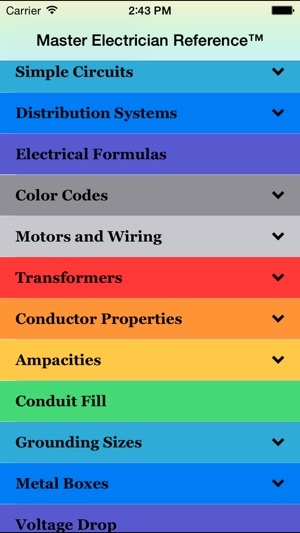 - Color codes for capacitors and resistors. - Standard motor and motor starter sizes, tables of full-load currents, locked-rotor information, overload units, OCPD, nameplate information, synchronous motor speeds, three-phase STAR and DELTA diagrams, three-wire start-stop diagram, motor frame dimensions, and motor enclosure types. 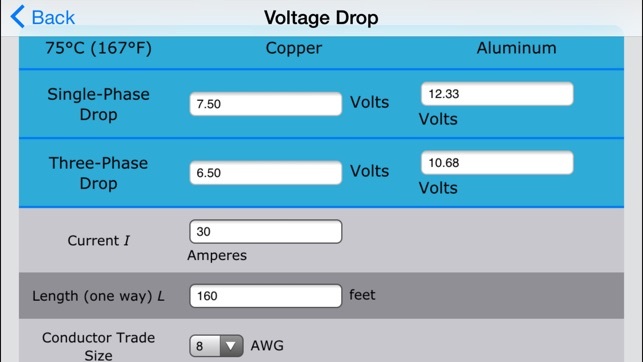 - KVA ratings for single- and three-phase current, transformer formulas. - Conductor tables, AWG and metric wire sizes, twist-on pressure connectors, and wire combinations. - Ampacities in raceway, cable, earth, and free air, and derating tables. 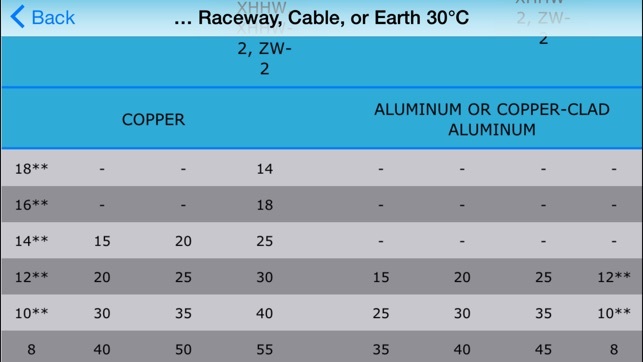 - Equipment grounding conductor (EGC) and grounding electrode conductor (GEC). 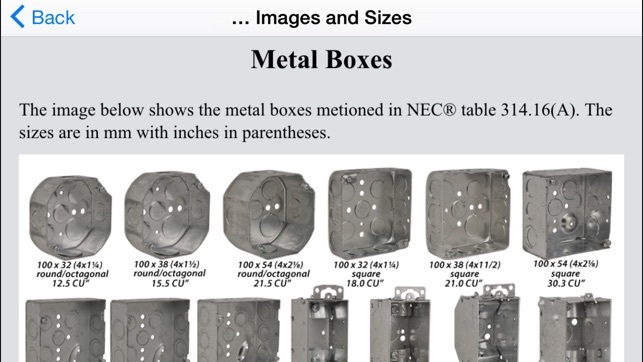 - Images and sizes of metal boxes, junction / device boxes, junction / pull boxes. - Plugs and wiring diagrams, enclosure types, standard underground boxes, standard fuse and breaker sizes, standard pull box / junction sizes, standard gutter and wire-ways, standard switchboards, standard busway, standard busbar ampacity, standard panelboard sizes, and standard disconnect sizes. - Formulas for geometry, fractions, temperature conversion, trig tables, unit conversions, metric prefixes, and conversions between inches and millimeters. - Includes the guide "The Master Bender Way" on how to bend conduit. See the Master Bender app or MasterBender.com website for more information. 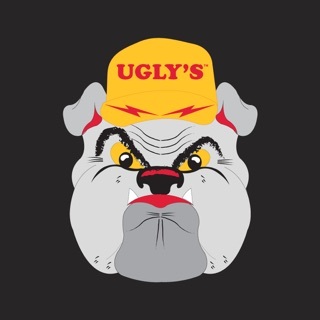 - Fluorescent, high-intensity discharge, incandescent, LED, and low-pressure sodium. - Lugs, bolts, and screws, tightening torque. - Lock-out / tag-out (LOTO), and a safety manual and first aid. Most pages contain a general scientific calculator. It is expression based: Just enter an expression and evaluate it. It understands trig and power functions, can convert between radians and degrees, and has built-in basic constants like pi and e.
MER includes key NEC tables from the National Electrical Code (NEC) 2011. We also have versions of MER available for NEC 2014 and NEC 2017 code years. Visit our website at MasterSparky.com for more information. ► We have fixed some bugs. ► We have updated the NEC Adoption Notice map to show how 2017 NEC is gaining momentum. Please check which version of NEC is used in your area. You should get the version of our app that matches the NEC code year. This version supports the 2011 NEC -- which is now used in fewer and fewer States. If your State has moved to the 2014 and 2017 NEC, we strongly recommend you move to MER 2014 or 2017. I live in the state of Texas, where we use the 2014 NEC. I wanted to download the 2014 version and all I saw were the 2005, 2008,2011 version, is it possible to download the 2014 version without incurring any further cost. We have versions of MER for 2011, 2014, and 2017 NEC. If you have one version, you can upgrade to the next version at a discount by buying an App Bundle of two MER versions. Basically, whatever you paid for the first version of MER will be subtracted from the bundle price and the result is an over 50% discount on the second version of MER. I'm sorry your bought the wrong version of MER. Apple handles all the aspects of the purchase, and as an app developer, I can neither initiate a refund nor exchange one app for another. App is not user friendly and doesn't do any calculations. Just a bunch of tables and formulas that aren't organized in a user friendly fashion.